Vanua Levu Island is the name of the second largest island in Fiji. 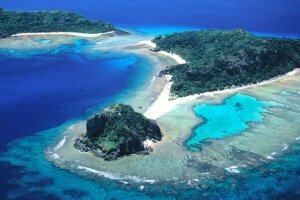 It is much less populated than the main Fijian island and has a central mountain range that effectively divides the island into 2 sections, the wet south eastern part of the island and the dry north western part of the island. Labasa on the north coast is the largest city on the island and is the main commercial centre, whilst Savusavu on the south east coast is the main port for all boats to and from Vanua Levu. There are airports in both of these major towns as well as a number of other airstrips dotted around the Vanua Levu island. To get to Vanua Levu Island you can either go by air or boat from the main island of Viti Levu. Flights leave from the Nadi International Airport twice daily to Savusavu, whilst flights from the Nausori International Airport in Suva operate twice daily to both Labasa and Savusavu. Flying is much quicker and provides excellent views, whilst travelling by boat is much slower. A number of shipping companies including Patterson Brothers Shipping, Consort Shipping and Beachcomber Cruises provide passenger ferry services to Vanua Levu from Suva, Lautoka, Ellington Wharf, Taveuni and Ovalau. You can click here to see all Vanua Levu Island Rates & Availability. The Namale Spa Resort is situated on the northern Fijian island of Vanua Levu and has breathtaking views of the Koro Sea. This boutique Vanua Levu Resort provides an authentic Fijian experience with traditional bures that are luxuriously furnished, delightful dining that is a fusion of international and local tastes, tropical gardens and a magnificent beach. The Namale Resort and Spa has many different activities on both land and sea, meaning that you have have a relaxing holidays where you can do and much or as little as you want. The Koro Sun Resort and Rainforest Spa is an all inclusive tropical Fijian resort that is perfectly positioned on the island of Vanua Levu. The Koro Sun Resort in Savusavu is a great place to experience a romantic getaway or have fun with the entire family. The property contains a Rainforest Spa with full spa amenities, 9 hole adventure golf course, on-site kids club, a range of accommodation options and a friendly, relaxed atmosphere. Being one of Fiji's first over-water resorts the Koro Sun Resort includes lots of adventure activities including scuba diving, snorkelling, dolphin encounters and much, much more. The Palmlea Lodge has new 1 and 2 bedroom ocean view villas that overlook the Great Sea Reef. This boutique resort is located on Vanua Levu Island, 15 minutes from Labasa Airport, and provides the perfect base from whcih to explore everything that Vanua Levu Island has to offer. Guests staying at the Palmlea Lodge & Villas can experience the fresh local cuisine or enjoy the adventure activities which include hiking, snorkelling, surfing, fishing and sightseeing. All of the accommodation rooms at the Savusavu Hot Springs have commanding views of the water and surrounding mountains. The township of Savusavu is the perfect place from which to explore the unbeaten tracks of Fiji's Vanua Levu Island, including Namena, Koro, Ovalau and Taveuni. This relaxing tropical Fijian resort is positioned on a picturesque bay that is teeming with fish and surrounded by mountains, making it the ideal place for an adventurous holiday. If you want hotel and/or resort accommodation on Vanua Levu Island at cheap rates for your next holiday then Holidays Fiji is the place for you. We give holiday travellers the ability to compare a range of hotels, resorts and apartments at the same time, thus making it easier for you to decide where it is that you want to stay. So book your accommodation at any of the Vanua Levu Island resorts with confidence, and even take advantage of the cheaper rates for longer stays.